Most of the discussion of Talpiot Tomb B has focused, understandably, on the image that they claim is a big fish, pointing downwards, and spitting out Jonah's big head. As opinion on that image is coalescing around the idea that the image is more likely to be some kind of amphora or unguentarium (see especially here and here), it is worth taking a closer look at the contextual information provided by one of the other images on the ossuary. 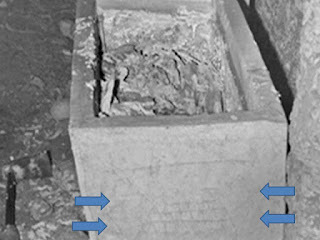 When Amos Kloner investigated this tomb in 1981, he took a picture that enables us to see one of the ends of the ossuary that is now obscured. 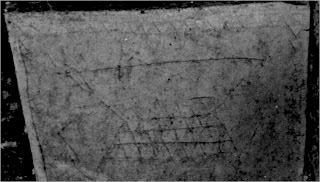 Jacobovici's and Tabor's investigations were unable to get a clear picture of this so we are reliant on Kloner's 1981 photograph, helpfully reproduced on the Jesus Discovery website (but there erroneously dated to 1980). I've been staring at this photograph a good deal, much of the time in amazement and frustration that Kloner did not think to photograph the ossuary form the other side so that we could see the whole of that really interesting front panel that is now the focus of so much discussion. Nevertheless, from Kloner's photograph, one can clearly see an image. 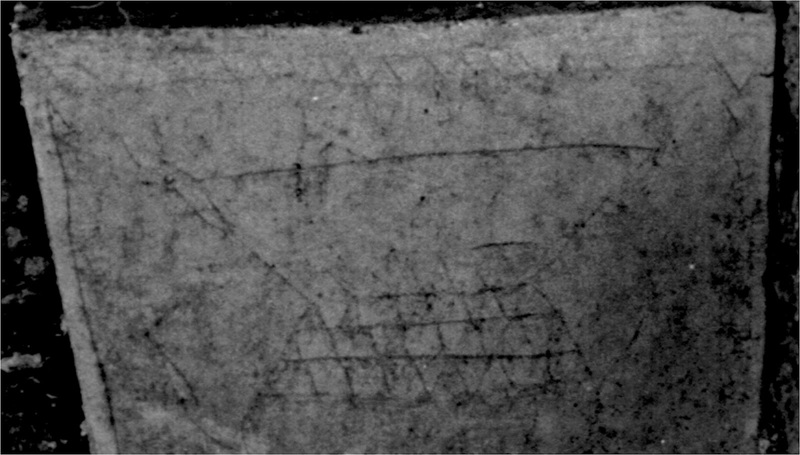 It is interpreted by Jacobovici and Tabor as a "half-fish", pointed downwards. They argue that it is part of a narrative that the ossuary tells about Jonah and the fish. It therefore provides corroborating evidence for the idea that this is a "Jonah ossuary". But is this a half-fish or is it some kind of vase? These apparent images of handles greatly detract from the plausibility of the idea that this is a "half-fish" and, at the same time, this detracts from the plausibility of the interpretation of the image on the front of the ossuary as a fish. It is worth bearing in mind that there are ossuaries that feature more than one amphora, and so the presence of a vase on the side of the ossuary makes it all the more likely that it is also some kind of vase on the front, as Tom Verenna has noted (with illustrations; scroll to the bottom for the key information here). Indeed, it may even be that a left handle is visible on the alleged fish picture on the front of the ossuary -- see again Tom Verenna -- with the caveat that we need to see more images of this to make a judgement. These lines are not, of course, visible on the doctored image. Update (16 April): In re-reading this post, I noticed that I did not go back to add an update to Robert Cargill's post Sins of Commission and Omission, which deals with the question of handles on the image above ("the half fish") and the controversial "Jonah" image. Mark, I believe that Don Griffith was referring to a different handle-shaped line at the top-left corner of the rim on both images of the ossuary, whereas your blue arrows point to the obvious ones attached to the middle of the object. If I read Don right, he is referring to these obvious handles on the half fish but also to a possible handle on the Jonah fish at the top left and it is the latter that Tom Verenna shows too. Pleased that you think these handles are obvious, though. That was my feeling too. Had another look. See what you mean. Yes, possible handle at the top left too and that correlates with the other image. I should point that out too. Thanks. Mark, the line that Tom highlights on ossuary 5, left side of the image, is the border of the ossuary--you can see the sawtooth image, see the other untouched photo. It is definitely not a handle. Mark, you or someone else pointed out that the 1981 photos were labeled 1980 by mistake. We corrected that a few days ago, so thanks if it was you. I commented on Don's post at the ASOR blog so won't repeat it here. The reason the CGI image does not have the border line that Tom thinks is a handle is because it was of the image itself, not the borders. The half-image, whatever it is, is not “cut off” from view. The space below it is clear–it is simply not drawn, which led us to conclude it was purposeful–a half image. It is not finished in terms of execution (i.e.,. filled in, etc. )–much like the MARA rosette, but it likely is in terms of intention of shape. In other words someone sketched out a “half” of whatever it is. So like the up-side-down tower this would be a top third of a vase, by your view. Our judgment was that it was more likely a fish, for that very reason. Mark, I also wanted to note that we are not sure that Kloner took the 1981 photos, see my article on bibleinterp.com and the description in the book for the best account we have been able to reconstruct by interviewing all the witnesses. Amos says he was only in the tomb for 15 minutes. The niches were blocked by huge blocking stones. That led me to conclude the photos were taken perhaps taken a bit later, by Gat and Gudovitch perhaps. The photos are systematic, taken counterclockwise, niche by niche, as if the intent was to show everything in situ, though the lids in kokh 1 were removed. I think that is the reason the the images are not photographed. Speaking of 1981 photos, you will remember I mention the second name--besides MARA--I will try to post the IAA photo of that ossuary on the web site tomorrow so folks can try their hand at reading the faint inscription. Maybe someone can enhance it--we tried, and got maybe...IONAS, IONES, or maybe IOULIA. It would be nice to have a second name. It might tell us nothing, but who knows. Thanks for your comments, James. Interesting to hear that the photographs themselves may not have been Kloner's. Yes, I was the one who pointed out that it should be corrected to 1981 so thanks for that and yes, still there on the pics. themselves. The more I look at this image (the "half fish"), the more it looks to me like a vase (or half vase). The patterns on the object also resemble the border, don't they? So if they are supposed to be fish scales, then the border decoration is also fish scales. I am a bit confused as to whether you are arguing for an amphora or perfume flask for our "Jonah" image. As I wrote Tom Verenna this morning, there is a huge difference between an amphora and a perfume flask of this period (and even the earlier Hellenistic periods Taylor and Verenna have illustrated). They are not the same in either appearance or function, see Rahamani, Hachlili, and others. As you know the former were likely found on Roman style/Hellenistic largel tomb monuments and were associated with cremation, so their rare appearances on ossuaries were ornamental, since most Jews of this period and region did not cremate their dead. The latter, which never appear on any ossuary, are found in tombs connected to practical rites of burial, i.e., the scented oils used in preparing the body. No one, so far as our hundreds of decorated ossuaries go, put an image of an unguentarium on an ossuary. I am confused as to which you think our image is? Amphora or perfume bottle. The differences are great and the parallels are rare to none, depending on which you are proposing here. BTW, the 1981 IAA photo of the end of ossuary 4 (our map), which we could not get to, is up on our web site. If you zoom in you will see clearly there is a faint inscription. This, along with MARA, is no doubt one of the two "names" that Kloner noted in his brief time in the tomb--both were visible without moving anything. Why would someone draw a half-vase? Even when engravers sketch out their work, and leave it incomplete, the shape is there, as with the unfinished rosette on the MARA ossuary. In other words, you don't have a half-rosette. I know of no example of any ornamentation on an ossuary that is half-done like this. I stand to be corrected but I have tried to look at them all, not just in Rahmani but the full collections at Bet Shemesh and the Rockefeller, as well as the basement of the Israel Museum. I would not agree that it is a "half-drawn" anything since all we have is a photo of half the object. The very small section that appears to be "unfinished" may merely be flooded by bright light. I see this effect occasionally when studying photos of ancient inscriptions. Many thanks for your comments, James. At this point I am just asking questions. I am not an art historian, but those really look like handles to me on the "half-fish", so I wanted to put that out there where others too could take a look. There has been so much attention, understandably of course, on the big "Jonah fish" image that I think the "half fish" was getting neglected -- and it could provide really important contextual information, as you acknowledge. I too noticed that the line Tom marked as part of the handle was the border. However I'm not sure if that really invalidates the handle hypothesis. One feature that both drawings have in common is a projection of lines above and to the left of the left tip of the rim/tail. This is seen in both 16.jpg and 21.jpg on thejesusdiscovery site. On the image on the side in 21.jpg, there is what appears to be a curved line from the top of this projection on down (indicated by the arrows in Mark's version), which gives the decided impression of handles. There is no similar line on the other image, other than the border that Tom had highlighted. But what I would like to point out is that there is no space for another line. In 21.jpg, there is ample room between this projection and the left border. But in 16.jpg, the lines projecting from the left corner of the "tail" directly touch the border. So perhaps the line depicting the rest of the handle overlaps with or shares the same space as the border at least for part of the image? There seem to be, to my eye, other lines in the space of the border, but it is difficult to tell with the quality of the image. It would be good to see other quality images of these areas. It also looks like neither the museum quality replica nor the heavily clone stamped CGI image depict the area around the left corner of the "tail" very accurately. Hard to tell if they really are handles or just an illusion caused by the fuzzy image. It's an odd shape, could it be a bowl in some sort of stand - with the lower part decorated with triangles representing the stand? Paul, your SassonAncientArt has no handles, & I think the consensus is that there are jar-handles or fish-fins on both images of the ossuary. Your Flickr image is a painting, not an actual artifact. Yes, quite right about the red line being part of the border. The image looked as though the border veered off from the original handle and the line appeared to be on its own. However looking at other photos, I did note (in an update) that the red line was indeed part of the border. However there are still handles at the mouth of the vessel, so that still is a viable part of my image. Thanks for pointing this out. They are indeed handles, of the leather strap variety. The representation on the ossuary is that of an Ethiopian Messob complete with carrying straps on either side. My best guess is that Yonas' (still a widely used boys name in Ethiopia) burial box was given a messob so that he might never worry for food in his afterlife. Scales of a fish on the Talpiot ossuary?